Happy New Year!!! I hope you have a blessed 2014 with many joyous moments!! To start out with I am so excited to share Sparkle N Sprinkle's new character "Spunky"!! He's so stinkin' cute!!! Beccy is the artist and has given this guy so much character...wait until you see what else he's doing this year!! Sparkle N Sprinkle is also releasing a new stamp size of 3 1/2 x 3 1/2" and it's just the right size stamp set for a quick bunch of cards or and embellishment to a scrapbook page. 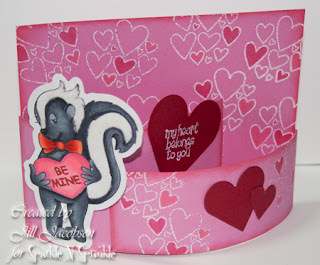 Spunky also has a Cut File to go along with him as well as a digital stamp set if you prefer. You can find all the Spunky stuff here. This is the January Technique Card and it is a fun Bendy card. I've done several of these in the past and they just make a create display of your artwork! You can watch the video here and see exactly how it's made, then you can purchase the kit which has all the supplies you need to complete 5 of these cards. Thanks for stopping by and hope and pray you truly have a beautiful year!